If I press the magnify button one time, 5x, the video is no longer 59.940 (60p) it changes to 29.776 (30p) is that normal? or is anything else I have to change to get the 60p when I am in 5x? The x5 mode is only affected by the x5 preset in crop_rec; all the others operate on regular (non-zoomed) modes. 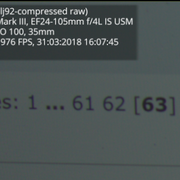 By default (even with vanilla Canon firmware), the x5 zoom mode operates at 29.776 FPS on 5D3 (not to be confused with 29.970 aka 30p) and captures a 3.5K wide image (YMMV on other models). Only a small part gets displayed on the screen, but the entire frame can be recorded. The x5 preset will override the FPS in x5 to 24/25/30p, as selected in Canon menu, for convenience, but that won't give you 3.5K at 60 FPS. The "1920 1:1 tall" preset also operates on 50/60p - you may be looking for that. HAPPY BIRTHDAY "3,5 K" ML !!!!! So, is there something to talk about today? Hi A1ex, thank you for your response, at first I didn't understand what you mean about using the 1920 1:1 tall, but after trying it , the look is close to the x5, thanks for the advice. ML Main menu said you can record continuously. First post recommends something else (real-time uses too much CPU), though I might have something that will help (check twitter). yes I changed preview to Frozen LV, same thing a few seconds as before. OK I'll wait for twitter post. By the way Happy Birthday ML 4K...Thank you very much A1ex and all the great people who made possible this awesome feature for the 5d Mark III !!! So I absolutely love MLV Lite and the Crop rec 4k module. So many awesome things in the newest build. I had a couple of thoughts. It would be awesome to be able to get into our favorite crop rec 4k mlv lite settings faster like custom presets. Presests specific to MLV lite and crop rec 4K. I threw the shutter option in there because it's just one more step we don't have to take if we are trying to stick with a certain shutter degree ex 180° shutter. That way we can get in and out of our favorite crop rec 4k MLV lite settings faster when doing some run and gun. Also it's real tricky monitoring in the framing modes. I see how they help with write speed and its incredible that we even get framing period but I would love to be able to contribute to better live view. Especially for the less intensive settings. I realize NONE OF THIS IS AND EASY TASK. And I am sure most of this has been mentioned. I am sorry for my brain storming but I thought I would throw it out there. I'm just a humble tester and user so take this all as a grain of salt. I am overjoyed with 1920x1080 24fps RAW with sound and fast start by itself. Just contributing my thoughts. Was it hard? You can customize pretty much any ML settings. You can assign these presets to hotkeys or create custom menus, too. See the Lua API for more. 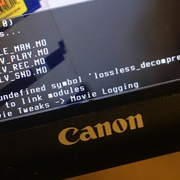 - When switching the video setting in Canon menu, which is not available to Lua. A long time ago, ML had the option to switch video modes from code... until I've got a corrupted H.264 (fixable by clearing Canon settings). Maybe worth a second look, after understanding how these settings are changed. Tip: use these often enough and they will appear in the Recent (star) menu. BTW, why did you choose 10-bit uncompressed (70%) over 14-bit lossless (50-65%) for 60p? Are you shooting at ISO 6400+ ? I had some issues when shooting in 14 bit lossless at ISO 100 when shooting up at the trees on overcast day. Using March 10 2018 build 5d3 113. Can shutter speed be changed with Lua too? 1/125 with 60 or 1/50 for 23.976? See also Bracketing with flash (another simple example). Thanks for easy to follow lua examples. A piece here and there helps moving forward. Modifying a lua script from a1ex... this is a proud day for me especially since it worked. Thank you thank you thank you for scripting this a1ex!!! These have shutter speed changes depending on frame rate. The shutter change has to be put after the frame rate change otherwise you will crash the script since the canon wont allow you to use a shutter lower then 1/60 in a 60p mode. Check this before you use because I KNOW nothing about ML code but I was able to quickly toggle between 1920 2.35:1 24fps and 1920x800 60fps. Much faster. I assume this will only work in manual mode since shutter speed is being modified. Definitely triple check these before using ha ha warning I stink at this it might break your cam ha ha. I'm running into an error when I try to load multiple modules on crop_rec_4k builds. The error initially showed up on the magiclantern-crop_rec_4k.2017Sep06.5D3123 build, which I had installed on the SD card and was working previously. I still get the same error when loading modules. I've tried searching for a solution and haven't found anything that worked. Any help on this would be appreciated. Thanks! Hard to keep up with the changes. What's strange to me is that the build I was using worked previously and then stopped working. I don't know if this discussion should be here but I've found that I have some issues making 4:3 recordings. With 1440x1080px it is possible to record with a 4:3 aspect ratio and get realtime preview but you need to press half the shutter and mantain it pressed (the crop window goes away when recording, you can only see a full 16:9 image). Not perfect but it is possible to use tape to cover the sides in the worst case scenario. With higher resolution (1728x1290px for example) we can press half the shutter and get a realtime preview of the image but as soon as you hit record and press the shutter, it changes the real aspect preview to a croped one, wide aspect, not very useful at all. And this extra resolution (above 1440x1080px) would be very welcome. Both working in non crop mode. I understand that in croped mode the real time preview would be not possible, and I understand the limitation of 1032px (maximum height resolution) with slow motion recording too. Is possible to solve this? Reproduced. ML uses some heuristics to pick between real-time and framing-accurate preview, and looks like you have found some cases where the automatic choice is not the best. However, this is just the default behavior; you can customize it from the raw video submenu. Should the option be renamed or moved to make it more obvious? Half-shutter is meant for quick (temporary) changes in preview; you don't have to keep it pressed. If you have to do that, you may want to look in the menu. 1032px - how did you get this value? On 5D3, the closest limit is 1040px at 48 FPS (overridable from menu). Which CF card are you using? What would you recommend to use? I don't know if I understand que question because English is not my native language and I don't know if I could understand this context very well, but from the two options I think 'renamed' would be my choice. With slow motion you will only get the real 4:3 aspect if you lower the height pixel dimension to 1032px so you can use 1376px at the larger side. With 1040px it is very close to 4:3 but does not have the perfect aspect ratio. Thanks for the inputs, a1ex! After 1 or two or three minutes recording stops with a message: Emergency stop. Movie recording has been stopped automatically. Timer icon is green. That message appears when the H.264 buffer becomes full. Are you recording both RAW and H.264 on the same card? If yes, try recording H.264 to SD. You are right Alex, as usual. I am very sorry. RAW and H.264 were recoded on CF. I do not know why. I did not change settings for cards. Playback card is CF and play separately in Canon menu. ML menu- Card setting - Preferred card-off. Every time I used these settings and RAW and H.264 recorded on two cards. But now they are recorded on CF both. I can not set camera for two cards recording. How?